Product code: ES6293 Categories: Sold Items, Sold Jewellery. 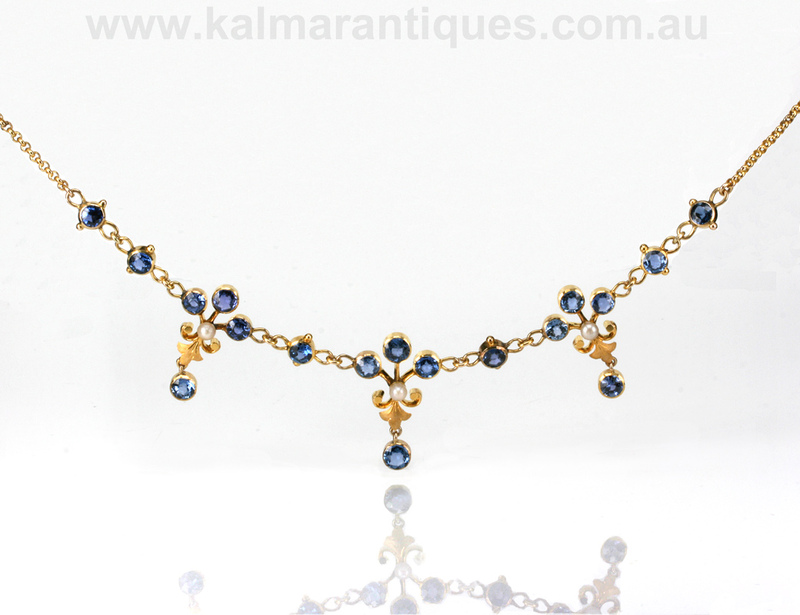 Here is a very elegant antique sapphire and pearl fringe necklace that sits perfectly on the neckline an is destined to always be admired. Dating from the early 1900’s in the Edwardian period, this fringe necklace was made in 15ct gold and set with a total of eighteen Ceylonese sapphires that come together with a total weight of 4.50 carats. The colour of the sapphires are just gorgeous and are highlighted not only with natural pearls, but the design of the three drop sections as well. Laid out from end to end the necklace measures 43cm in length making this sit perfectly on the neckline and will make any woman walk tall with this adorning her neck. Simple, elegant and refined are all words that can easily be used to describe this spectacular antique sapphire and diamond fringe necklace.